It looks like I’ve been living under a rock, because I’ve only discovered smoothie bowls lately. I usually have smoothies or oatmeal for breakfast, but when I heard about smoothie bowls, I was hooked! Basically, a smoothie bowl has the same ingredients as a smoothie, only it is more concentrated and you get to devour it out of a bowl, with a spoon. The liquid content is less than that in a regular, drinkable smoothie, which makes the consistency thicker, richer and creamier. Usual smoothie bowls consist of dry ingredients (fruits such as banana, peach and red berries, veggies such as cucumber and kale, and herbs such as spinach – frozen or not frozen) and wet ingredients (milk – dairy or non dairy, yogurt, water, coconut water, etc.). The thickening agent can be oats, frozen fruit, peanut butter or any other nut butter (almond, cashew, etc. ), or chia seeds for a protein boost. Eating the smoothie out of a bowl also means getting creative with the endless topping options: fruits, nuts, seeds, chopped chocolate, granola, shredded coconut, etc. 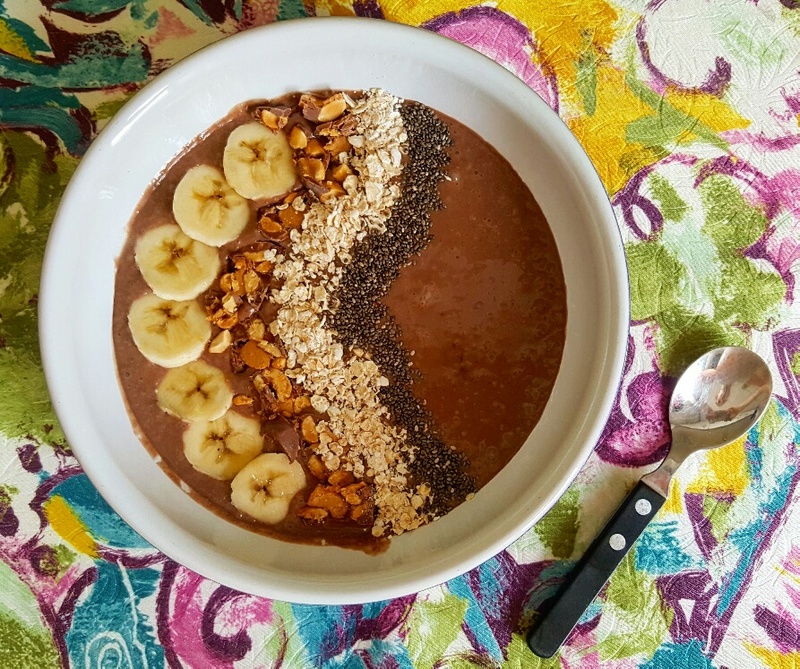 This is exactly what makes a smoothie bowl such a fun breakfast! If the above hasn’t convinced you yet, smoothie bowls can be prepared in under five minutes, to be devoured immediately. How convenient is that? Some people add protein powder to their smoothie bowls for an even more nutrient dense meal. I keep mine all natural. I’ve been experimenting with different ingredients and toppings for the past couple of weeks. I am proud to say that I got the consistency wrong for the first time only, and then it was nothing but rich, creamy goodness from there. 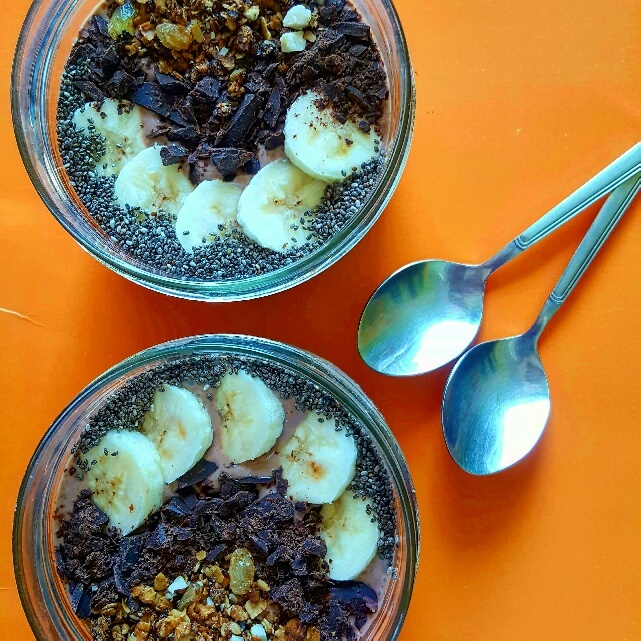 I made banana and peach bowls, banana and berry bowls, green smoothie bowls, and the best of them all were obviously the peanut butter and chocolate smoothie bowls, which tasted just like a decadent dessert! I am absolutely in love! 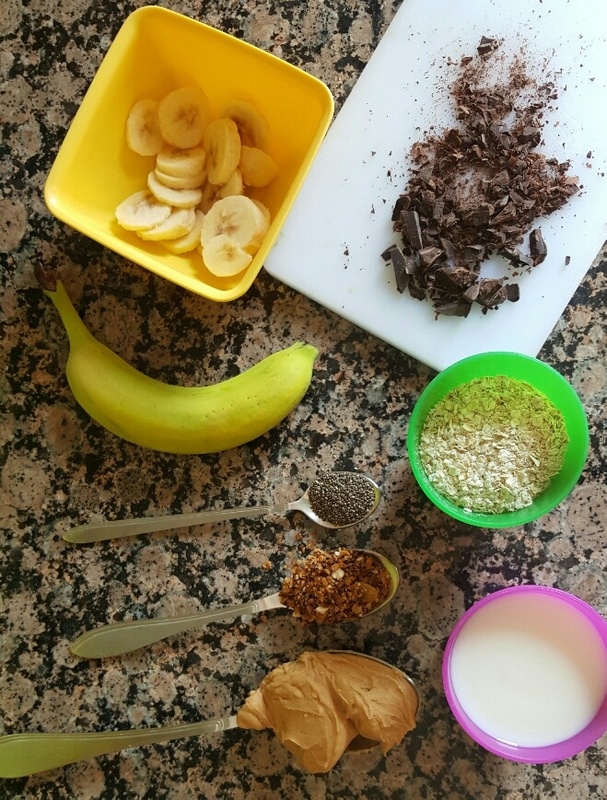 Today I will share with you the chocolate smoothie bowl recipe. I figured it would be a good start for someone who has a sweet tooth as I do. The recipe yields 2 bowls. In a blender, blend together all ingredients. You might need to turn your blender off to scrape down the sides and then blend again until all ingredients are well incorporated. Divide the smoothie equally into 2 bowls. Now comes the fun part: the toppings! 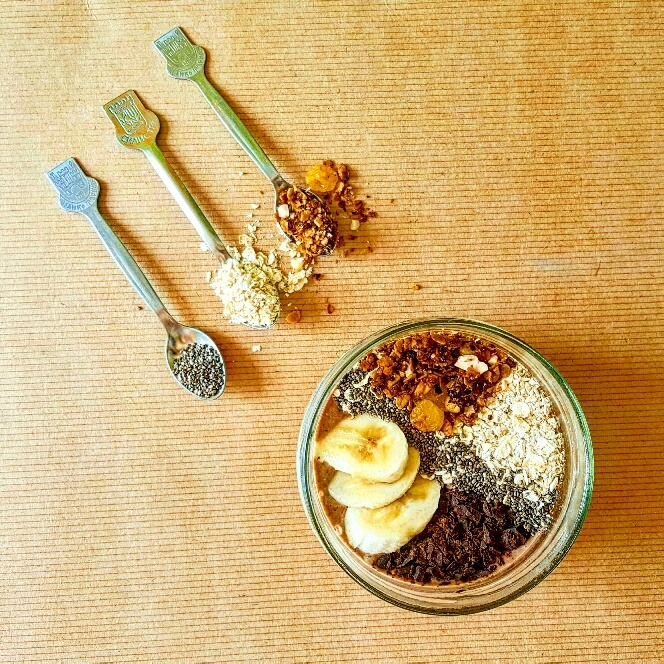 You can top your chocolate smoothie bowl with chia seeds, sliced banana, granola, regular oats, chopped dark chocolate (in moderation! ), chopped peanuts, anything! Unleash your imagination! Below are a few serving suggestions and topping options. Chocolate PB smoothie bowl topped with sliced banana, chopped Reese’s nut bar, oats and chia seeds. Toppings: sliced banana, chopped dark chocolate (72%), homemade granola (oats, raisins, chopped almonds), and chia seeds. Pingback:	How Many Calories Does A Peanut Butter Sandwich - All Answers Here!